The Lagavulin distillery on Islay is home to perhaps one of Scotland's most famous whiskies. The peat and iodine of the sea give its renowned flagship 16 y.o. single malt a pungent smoky flavour with tones of sea salt, rich fruits and lapsang souchon (smoked tea) which can divide tasters - many consider it to be amongst the world's smokiest whiskies. Lagavulin also regularly produces special edition whiskies, including a 12 y.o. and 21 y.o. There are almost no independent bottlings that feature Lagavulin whisky - currently as much as 98% of the spirit is earmarked for maturation as a single malt, and the distillery does not produce blends. Nestled on the south of Islay, Scotland's whisky island, Lagavulin can be found sitting quietly in its small and beautiful bay, within view of the Dunyvaig Castle ruins. The distillery's water source, Lochan Sholum, is situated 200m above sea level, and the water flows down the hillside through the peat - this water helps give the whisky its distinctive taste. Of the Islay whiskies, Lagavulin undergo the slowest distillation - for the first distillation approximately five hours and more than nine hours for the second. The view of the Lagavulin Distillery. Lagavulin uses the double distillation method. The wash is transferred into one of the 11,000 liter wash still where it is very slowly distilled. These wash stills are filled to 95% capacity which gives less contact between the alcohol vapors and the copper sides of the still. Some of the heavier elements from the vapour are attracted to the copper resulting in a cleaner and softer taste - the less contact, the more fusel alcohols you can get. The 'cut,' or what's taken out of the spirit still, is larger than at most distilleries, with the focus on character more phenols are retained. The spirit stills at Lagavulin a a bit larger (12,500 Liter) than the wash stills. The stills at Lagavulin are unusually shaped - resembling an pear - with a rounded base, a high apex and narrow, steep sloping lyne arm. The pot stills of the Lagavulin Distillery. In 1974 the floor malting at Lagabulin were closed and since then the malted barley the distillery uses is obtained from the local Port Ellen maltings. The malt produced there for Lagavulin has its own particular 'recipe' which involves being dried by hot air and then by the island's peat for specific periods of time. The drums are computer-controlled and have a high degree of precision which ensures the same degree of phenol absorption is achieved each time resulting in a more consistent malt. The malt mill of the Lagavulin Distillery. The current white-washed brick warehouse was built in 1962 after renovation work which integrated the buildings of the Malt Mill distillery with those of Lagavulin - the present day visitor centre is actually what remains of the Malt Mill. As with many whisky producers, Lagavulin uses ex-Bourbon barrels and sherry casks. A final bottle of Lagavulin will be a combination from these Bourbon barrels and the sherry casks to sweeten up the malt. The warehouses are all exposed to the sea and so the casks absorb the typical sea, iodine character that you find in the Lagavulin Single malt. 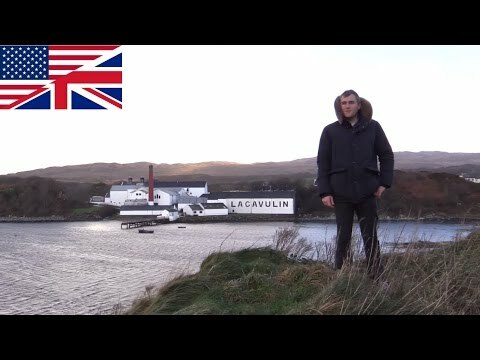 Lagavulin can legitimately claim to be one of the oldest distilleries in Scotland - records show that there was illicit distillation taking place on the site as far back as 1742. Lagavulin officially dates back to 1816, when John Jonston and Archibald Campbell constructed two distilleries on the site, although two decades later the Ardmore and Lagavulin distilleries were combined. During the 19th century, the several legal battles ensued with the neighbouring distillery Laphroaig, which started after Sir Peter Mackie, the distiller at Lagavulin, attempted push Laphroaig from the market by making a replica whisky - due to the difference in the peat and water at the two distilleries, the Lagavulin whisky was different but production continued. In 1962 the still house was rebuilt, incorporating the stills of the Malt Mill Distillery and in 1996 the machinery was updated, including a new mashtun and automated controls. During most of the 1980s the distillery was only in operation for two days a week, although production increased again in the 1990s. The Malt Mill was featured in the 2012 film The Angel's Share. Lagavulin is currently owned by Diageo plc. A tasting room in the Lagavulin Distillery. The visitor center, housed in the old Malt Mill, dates back to 1998 and is open year round although opening times vary. There are a lot of different tours at the distillery. You can book the normal tour with a small tasting or book premium tours which include a full warehouse demonstration with samples directly from the cask. The gift shop sells the Lagavulin range of malt whisky, gifts and souvenirs. Share your experience with other whisky lovers. Write a note about your trip to the Lagavulin distillery.